This is a science experiment that Olivia did. 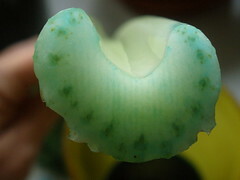 She put a stem of celery into a cup filled with blue water. 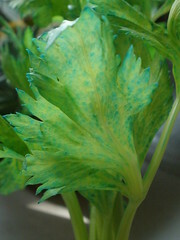 After several hours, the leaves on the celery will turn blue to show where the stem brought water to the leaves. This experiment is suppose to represent how a tree pulls water through its trunk, limbs, and branches in order for water to reach each of its leaves. 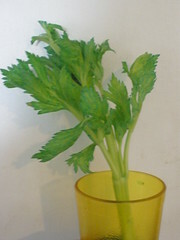 The blue-dyed water reached the very edges of the celery leaves. This was a great visual image that brings to life what we were reading as part of her homeschool science lesson. Reading about plants and trees is one thing…seeing how they “operate” is a totally different thing!